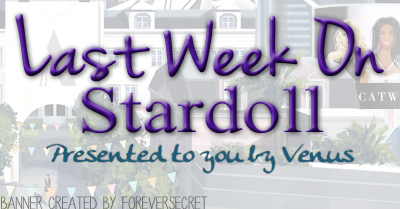 Another slow week on Stardoll. Which honestly I don't mind too much, since I get to save my hard earned stardollars. And maybe Stardoll staff are working on some fabulous new update. Or they are just taking a small break. Or something else. Never mind, let's see what we got this week. 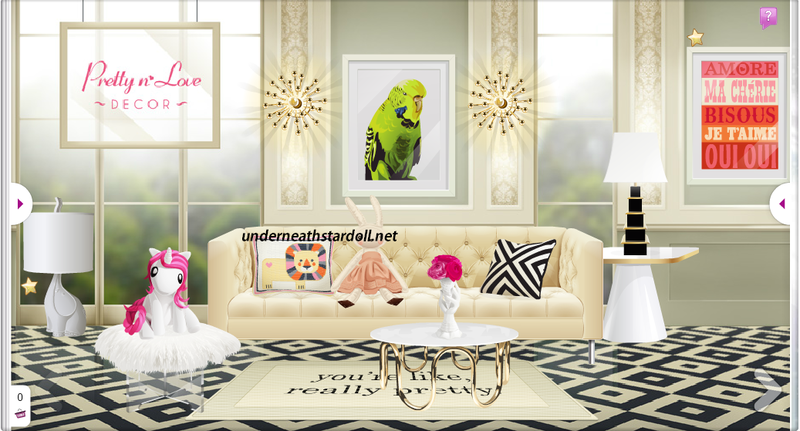 On Monday, Stardoll released a new floor of Pretty'n'Love interior collection. The collection is nice, but nothing special to me. There are few interesting and unique items, but most of the stuff seems too ordinary. I mean, we have a couch (which is actually really pretty, and big), a side table, a lamp, coffee table, painting (or is it a photo? ), few pillows, etc. There are some superstar only items, of course. I like the rug, actually, it does stand out, not a big fan of a font used, though. On Wednesday, guess what - another Callie's Picks collection. This one is named "Cozy Coats". It is perfect for this time of a year. A variety of nice, warm, some a bit unusual coats. I like that Stardoll took idea from one of their members. And even there are many different coats, I like only one or 2 items. I'm just not a big fan of coats, I prefer blazers or shorter jackets. Mannequins are dressed nicely, unlike in some previous collections. There are 2 coats that look like your doll is making a pose, which seems to be popular nowadays. As usual, I'll probably wait until the last day to decide whether to buy something or not. I'll probably get the red coat. And on Friday, when everyone expected something big, we got a nice Subcouture collection. I gotta say I am not really impressed with the collection. Coming from a person who bought whole previous 3 collections. It would have cost me about 550 sd to buy a whole new collection, without the superstar items. And I could afford it, but what for? I know many did like the collection, many disliked it too. To me, it is the least appealing one. I do like the black dress, gold dress, and some shoes. You should though check it out, try some pieces, you may be surprised how good it mad look on your doll and how well could you combine the individual pieces. You should hurry though, you got a little less than 14 hours left to buy stuff before they leave the store. Like I said, I am saving up my stardollars for a holiday season on Stardoll, and maybe for some fab updates. The end. Slow week, told you so. As I again do not feel much inspired to write a unique, interesting closing, I'll just say the usual - vote on the poll, make a comment, and see you next week.